Private lessons are great if you prefer to learn one-on-one. 100% of my time will be devoted to your sewing experience and since it’s all about you while you are here, your lesson is customizable. If you have a sewing buddy, the two of you may make your lesson semi-private for additional $25 per hour. Click here for examples of private lessons. Times I hold private lessons throughout the week with flexible timing. Email me with your lessons request and we will agree on dates/times and you can reserve them from there. Follow the link right after the private lesson pricing, select the number of hours and add to your cart. -Machine & Sewing Basics 5-hour bundle (Two 2.5-hour sessions/ $250) Brand new to sewing or want a solid refresher? This is the place to start. Makes a great gift certificate to go along with the gift of a new sewing machine! But folks, read my blog post “how to choose a sewing machine” before you shop! Session 1: You will learn how to thread your machine, wind the bobbin, sew forward, reverse, turn curves and corners, how to secure your seams, and proper pressing techniques. We will also look at perfect tension. You will create samples that you can refer to later. We will discuss several basic sewing supplies. You can sample each of them and avoid the buying mistakes you might make walking blind into the fabric store. Click here for a basics sewing supplies list. Session 2: You will make a quilted zip-top pouch, a decorative pillowcase, or flanged pillow—your choice. Can I make something else, you ask? Of course! Let’s talk. Use your machine or mine! I have all the sewing supplies you need, you just bring fabric and thread for your chosen project. Click here for a printable bring list for each of these projects. -Quick Start Basics (One 2-hour session, $120) great for a beginner who just needs a little direction or as a refresher. You will learn most of Session 1 from the Machine & Sewing Basics 5-hour Bundle– how to thread your machine, wind the bobbin, sew forward, reverse, curves and corners, how to secure your seams, and proper pressing techniques. We will also look at perfect tension. You will create samples that you can refer to later. We will discuss several basic sewing supplies. You can sample each of them and avoid the buying mistakes you might make walking blind into the fabric store. Click here for a basics sewing supplies list. 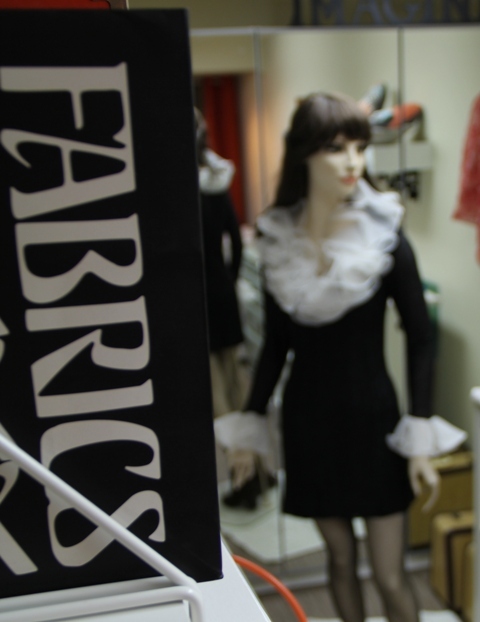 -Beginning garment sewing 5-hour bundles used at your pace. Get much more sewn if you do homework between lessons. You can work through a series of projects or just one: a chef or artist apron, a pair of drawstring PJ pants, an a-line skirt, or…what’s next? You decide. You will make technique samples for each project for practice and to refer to later. -Beginning craft sewing 5-hour bundles used at your pace, but with an emphasis on non-garment sewing. This is especially popular with kids, but adults have fun, too. You can work through a series of projects or just one: a quilted pot holder (um, it’s cooler than it sounds and dangit, we use ‘em! ), easy messenger bag, a corded pillow, beginning quilt techniques, plush toys (my personal guilty pleasure). The sky is the limit! -The art of FIT Learning the art of fit is imperative for successful garment sewing, and it’s my personal specialty as a teacher. Learn the Palmer/Pletsch method of fitting using any commercial pattern. If you have sewn and struggled with fit, this track is for you. I know you will LOVE the results. I recommend all my fit students start with Palmer/Pletsch for McCall’s pattern 6750-a perfect blouse for learning fit. In general, it takes a student 5-6 hours to trim the pattern, pin fit, alter the tissue, cut from fabric, and do the first fabric fitting. Then the sewing starts! Just think that altering your pattern will take you about 1/3 of your total project time. Like everything, you get faster and better as you practice. For private lessons, a 5-hour bundle will get you through fitting the blouse (you will cut fabric and sew mostly at home as homework). Want more fit? After the blouse, I can recommend more, and you can keep learning with me ‘til you’re off and flying on your own. -Zippers! Invisible, centered, lapped, fly, hand-picked. Learn some or all the easy way! For planning, you can say about 1 hour per zipper. -Pockets Cargo, patch, side-seam, welted, and many more. Plan on an hour for each, longer for welt pockets. -Applique A lovely way to adorn your projects. You can learn the secrets to making perfect shapes and hand or machine application. -Doll clothes The construction of doll clothing is different than bigger garments to avoid sewing in tiny circles. It’s fun and fast. And where do you get all those darling little buttons and findings? Mysteries unravel! -Jeans Yes, YOU can sew jeans! There is a logical order to sewing jeans so that you do most of the signature top stitching in the right order to avoid the constant re-threading of your sewing machine. And if you sew them with me, they will fit! -Sergers! 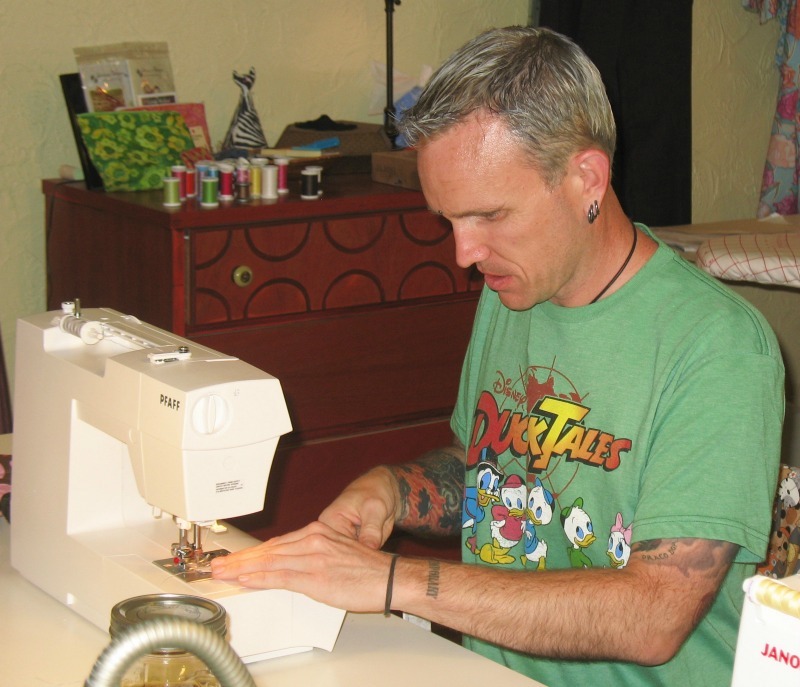 Learn to use your serger and put it to work for you. I love all the time-saving features of a serger and you will, too. A great beginning serger class is 5 hours. A serger 5-hour bundle will change your sewing life, I promise! In addition, I have three very different sergers that you can sample to see what it is you may want to invest in, if you don’t already have a machine. Hopefully this has given you some ideas. I had one gentleman take lessons to learn how to use a vintage Singer machine to he could repair his boat sails while he sailed around the world. In class he made some custom rail covers for his boat. Another student made doll clothes for a vintage Barbie her husband gave her for her birthday. Men sew, women sew, kids sew. No borders!